ROBERTSON, WILLIAM, the historian of Scotland and Charles V., was born in the manse of the parish of Borthwick, Mid Lothian, in the year 1721. His father, also named William, was at first minister of that parish, and finally of the Old Gray Friars’ church, Edinburgh; his mother was Eleanor Pitcairne, daughter of David Pitcairne, Esq. of Dreghorn. By his father, he was descended from the Robertsons of Gladney, in the county of Fife, a branch of the ancient house of Strowan. Dr Robertson received the first rudiments of his education at the school of Dalkeith, under the tuition of Mr Leslie, then a celebrated teacher. In 1733, he removed with his father’s family to Edinburgh, and, towards the end of that year, commenced his course of academical study. From this period till 1759, when he published his Scottish History, there occurred nothing beyond the natural progress of events in the life of a young man devoted to the Scottish church as a profession. During this long space of time, he was silently pursuing his studies, and labouring in retirement and obscurity on that work, which was afterwards to bring both fame and fortune to his humble door. Yet, though he thus permitted so large a portion of his life to pass without making any effort to distinguish himself, it was not because he was not desirous of an honourable distinction amongst men; but because he had wisely determined to do something worthy of a lasting reputation, and to do it deliberately, to secure, in short, a firm footing, before he stretched out his hand to seize the golden fruit of popular applause. That he was early imbued with literary ambition, and that of the most ardent kind, is, notwithstanding the long obscurity to which he was content to submit, sufficiently evident from the motto which he was in the habit of prefixing to his commonplace books, while only in the fourteenth or fifteenth year of his age. The motto was Vita sine literis mors est; a sentiment which adhered to him through life. Having completed his studies at the university, he was licensed to preach by the presbytery of Dalkeith in 1741, and in 1743 he was presented to the living of Gladsmuir, in East Lothian, by the earl of Hopetoun. This appointment came opportunely; for soon after he obtained it, his father and mother died within a few hours of each other, leaving a family of six daughters and a younger brother, almost wholly dependent upon him for support. With that generosity of disposition and warmth of affection, which are not deterred by personal considerations from discharging an imperative duty, he instantly invited his father’s family to his humble residence at Gladsmuir, where, we are credibly informed, his professional income hardly exceeded £60 a-year. Nor did his benevolence stop here. He undertook the education of his sisters, and on their account delayed a matrimonial union which he had long desired, but which he did not carry into effect until he saw them all respectably settled in the world. This accomplished, he, in 1751, married his cousin, Miss Mary Nisbet, daughter of the reverend Mr Nisbet, one of the ministers of Edinburgh. Previously to this, a remarkable instance of the enthusiasm of his disposition, and of the warmth of his patriotic feelings, occurred. When the capital of Scotland was threatened by the Highland army in 1745, Dr Robertson hastened into the city, and joined the ranks of the volunteers, who had been called up for its defence; and, when it was resolved to surrender the town without resistance, he was one of a small band who proceeded to Haddington, where general Cope then lay, and made offer of their services to that commander. The general, fortunately for Dr Robertson and his party, declined to admit them into his disciplined ranks, alleging that their want of that essential qualification might throw his men into disorder; and they thus escaped the dangers and disgrace which afterwards befell his army at Prestonpans. This rebuff terminated the historian’s experience of military life. He returned to the discharge of the sacred duties of his calling, and to the peaceful enjoyment of his literary pursuits. In his parish he was exceedingly beloved. The amenity of his manners, the purity and uprightness of his conduct, had secured him the esteem and veneration of all; while the eloquence and elegant taste which he displayed in his sermons, procured him a high degree of respect from the neighbouring clergy. These qualifications as a preacher, he had been at much pains to acquire, and he had early aimed at introducing a more refined taste, and a more persuasive eloquence, into pulpit oratory, than were then generally to be found. With this view he had, during the last two or three years of his attendance at college, maintained a connexion with a society, whose objects were to cultivate the arts of elocution, and to acquire the habit of extemporary debate. Dr Robertson himself had the principal share in forming this society, and he was fortunate in the selection of its members, the greater part of them having afterwards arrived at distinction in the different walks of life which they pursued. 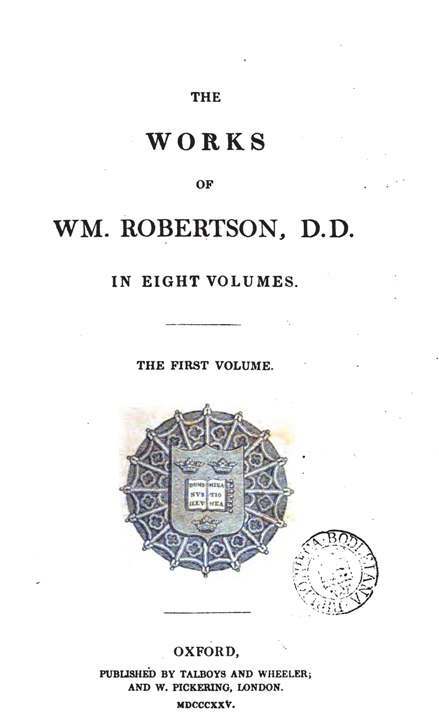 The first of Dr Robertson’s publications was a sermon which he preached in the year 1755, before the Society for the Propagation of Christian Knowledge. This sermon possesses a singular degree of merit, and exhibits all the felicities of composition and strength of reasoning, for which his after productions are so remarkable. That he himself had a favourable opinion of this sermon, appears from a letter written by him to his son-in-law, Mr John Russell, on June 16, 1788, along with which he had sent him, "as a monument of his friendship and attachment," a very handsomely bound copy of his works, as "I wish you to possess them in their most perfect form, as I purpose they should be transmitted to posterity;" and he adds, "my solitary sermon, naked as it came into the world, accompanies its well-drest brothers, but though the least of my works, I would not have you esteem it the last in merit." A few years afterwards, he made his appearance in the debates of the General Assembly, where his eloquence acquired for him the ascendancy which he long maintained as a leader in the church courts. It is remarkable that one of the first uses he made of his influence in the General Assembly, was to defend his co-presbyter Home from the censures of the church, for his having written the tragedy of Douglas. Dr Robertson could, indeed, scarcely have done less, after having himself taken part in the rehearsal of the piece, in common with Blair and Carlyle, as has already been narrated in our memoir of Home. He exerted himself warmly in behalf of his peccant brother; and it is allowed that his arguments and eloquence had a great effect in softening the vengeance of the General Assembly. As the play-going portion of the public sympathized but little in the feelings of the clergy on this subject, and felt besides a strong prejudice in favour of Mr Home, these efforts of Dr Robertson were exceedingly grateful to that party, amongst whom his defence had the effect of acquiring for him an extensive popularity. 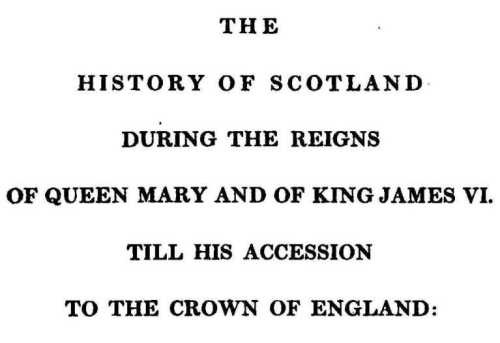 In the mean time, his "History of Scotland, during the Reigns of Mary and James VI.," which, in the midst of all his other avocations, he had been noiselessly, but assiduously bringing forward, approached to a close, and he was about to commit to the caprice of popular taste and opinion, the labours and the hope of years. On the final completion of that work, he proceeded to London, to make arrangements regarding its publication; and in February, 1759, it appeared. The effect which it produced, was instantaneous and extraordinary. Letters of congratulation, of admiration, and of praise, poured in upon its author from all quarters, and many of them from the most eminent men of the time, all outvying each other in the language of panegyric and compliment. Nor was it praise alone that attended his literary success; the work cleared to its author no less a sum than £600; preferment also immediately followed, and changed at once the whole complexion of his fortunes. While his work was going through the press, he had received a presentation to one of the churches of Edinburgh, to which he removed with his family; and in the same year in which the work was published, he was appointed chaplain of Stirling castle; in two years afterwards, he was nominated one of his majesty’s chaplains in ordinary for Scotland; in the following year, he was elected principal of the university of Edinburgh; and in two years more, appointed by the king, as historiographer for Scotland, with a salary of two hundred pounds a-year. From being an obscure country clergyman, he was now become one of the most conspicuous men in the kingdom. His society and correspondence were courted by the noble and the wealthy, and his self love was flattered by encomiums and eulogiums from the dignified and learned. [His friend, Dr. Carlyle, thus sarcastically remarks the rush of honours with which his merits were rewarded, in a letter to the reverend Thomas Hepburn, (author of a curious and clever jeu d’esprit, entitled "Mago-Pico,") dated Musselburgh, Sep. 5, 1763:--"Robertson has managed with great address. He is principal, chaplain, minister, historiographer, and historian; that is to say, he has 50 pounds a-year, and a house certain, besides what he can make by his books. It was taken for gratned that he was to resign his charge, on being appointed historiographer with 200 pounds salary; but that he will do at his leisure. It is also supposed by his patrons, that he is to write the history of Brtain in ten volumes quarto. This also, I presume (dreadful task!) he will execute at his leisure. Some of his advisers, in the warmth of their zeal, thinking that the Scottish church was too limited a field for a man of his talents, proposed to him to seek in the English church for rewards befitting his high merits. Into this proposal, however Dr Robertson did not enter, but continued to abide by both the country and the religion of his fathers; a line of conduct consistent with the purity and dignity of his character. The success of his "History of Scotland," now urged him on to further efforts, and he lost no time in looking out for another subject to work upon. After some deliberation, and carefully weighing the merits of several, he at length fixed upon a "History of the Reign of Charles V." This work, which appeared in 1769, in three volumes quarto, still further increased the reputation of its author, [In consequence of the great success of his History of Scotland, Dr Robertson received for Charles V. from the booksellers, no less than 4,500 pounds, then supposed to be the largest sum ever paid for the copyright of a single book.] and was received with equally flattering marks of approbation as his Scottish history. Hume, his contemporary and intimate friend, and who, superior to the low jealousy which would have seized upon a mean mind, on witnessing the success of a rival historian, had always been amongst the first to come forward and acknowledge his merits, thus speaks of the work, as it passed through his hands in sheets direct from the printing office: "They even excel, and I think in a sensible degree, your History of Scotland. I propose to myself great pleasure, in being the only man in England, during some months, who will be in the situation of doing you justice; after which, you may certainly expect that my voice will be drowned in that of the public." Mr Hume was not mistaken in this anticipation. Congratulatory and complimentary letters again flowed in upon the historian from all quarters, and his fame not only spread rapidly wherever the language in which he wrote was understood, but by a felicitous translation of his Charles V., by M. Suard, he became equally well known throughout all France. Previously to his undertaking the Life of Charles V., Dr Robertson had been urgently entreated by his friends, and had even the wishes of the monarch conveyed to him on the subject, to undertake a history of England. This, though promised the support of government while he should be engaged in the work, he declined, from motives of delicacy towards his friend Mr Hume, who was already employed on a history of that kingdom. He was afterwards, however, prevailed upon to entertain the idea, from the consideration that his work would not appear for many years after Mr Hume’s, and that it would necessarily be so different as to have an entirely separate and distinct claim on public favour, without any encroachment on the portion due to the merits of Mr Hume. The work, however, was never undertaken, nor is it now known what were the causes which prevented it. His biographer, Mr Dugald Stewart, conjectures that the resignation of lord Bute, who had always been a warm and steady friend of Dr Robertson, might have contributed to alter his view, with regard to the writing a history of England; but he acknowledges his inability to discover any certain or positive reason for the interruption of its execution. 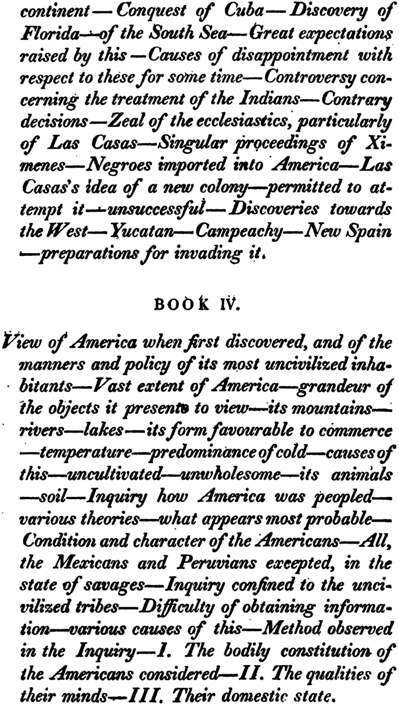 Eight years after the publication of Charles V., (1777,) Dr Robertson produced the History of America, a work which fully maintained the author’s high reputation, and procured him a repetition of all those gratifying marks of both public and private approbation which had attended his former works. One of these was his election as an honorary member by the Royal Academy of History in Madrid. This learned body at the same time appointed one of its members to translate the work into Spanish, and a considerable progress was made in the translation, when the jealousy of the Spanish government interfered to prevent it from proceeding any further. 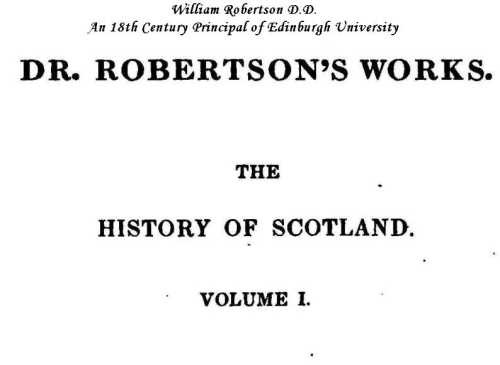 The reputation of Dr Robertson, however, did not rest alone upon his writings. His powerful and persuasive eloquence had gained him an influence in the General Assembly, which intimately and conspicuously associated his name with the ecclesiastical affairs of the kingdom. He introduced and established a system of subordination throughout the various gradations of ecclesiastical judicatories, which had not been before exerted, and the neglect of which had given rise to many unbecoming scenes in the settling of ministers; scenes deemed at once highly derogatory to the dignity of the supreme court, and subversive of all order in the church government of the kingdom. Of his eloquence, a part of his fame, as his biographer remarks, which must soon rest on tradition only, the latter thus speaks: "I shall not be accused of exaggeration, when I say, that, in some of the most essential qualifications of a speaker, he was entitled to rank with the first names which have in our times adorned the British senate." This is high praise; but when it is recollected who he is that bestows it, there is little reason to doubt its justice. Hanover. It appears from a letter to Dr Waddilour, dean of Rippon, dated July, 1778, that he had made up his mind to encounter the responsibilities of such a task: but he very early abandoned it, in consequence of a correspondence with his friend, Mr James Macpherson, who, three years before, had published a history of the same reigns, and whose feelings, he found, must be severely injured by his attempting a rival work. As he was now approaching his sixtieth year, it is probable that he was by no means eager to commence a new subject of study. His circumstances, too, were independent; he had acquired fame sufficient to gratify his most ambitious hopes: and thus were removed two of the greatest incentives to literary exertion. His constitution, besides, was considerably impaired by a long, sedentary, and studious life; and he probably conceived that, after having devoted so large a portion of his existence to the instruction and entertainment of others, he had a right to appropriate what remained to himself. In the year 1780, he retired from the business of the ecclesiastical court, of which he had been so long an ornament, but still continued to discharge the duties of his pastoral office, and that with a diligence, always exemplary, which increased rather than diminished with his growing infirmities. As long as his health permitted, he preached every Sunday, and continued to do so occasionally till within a few months of his death. 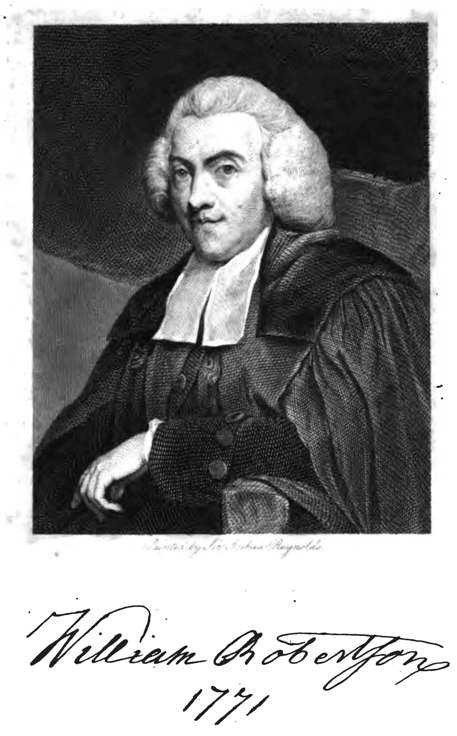 In regard to his style of preaching, his nephew, Lord Brougham, in his Life of the Principal, contained in his "Lives of Men of Letters and Science who flourished in the time of George III.," gives a very interesting account of it from his own personal knowledge; and in particular of a sermon which he heard Dr Robertson preach on November 5, 1788, the celebration of the centenary of the Revolution. Notwithstanding his resolution to write no more for the public, the Principal was accidentally led to the composition of another work. 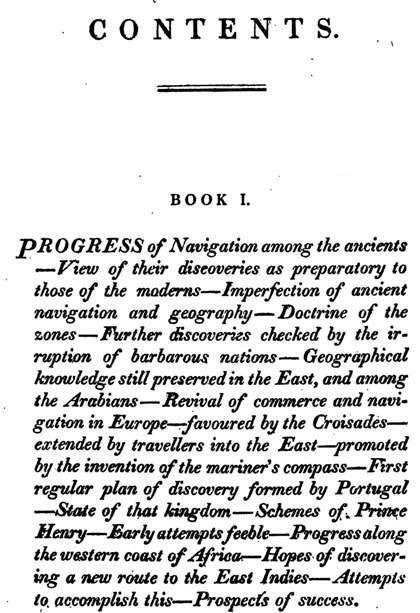 In perusing major Rennel’s "Memoirs of a Map of Hindostan," he began to inquire into the knowledge which the ancients had of that country, solely for his own amusement and information. His ideas, as he himself remarks, gradually extended, and became more interesting, till he at length imagined that the result of his researches might prove amusing and instructive to others. 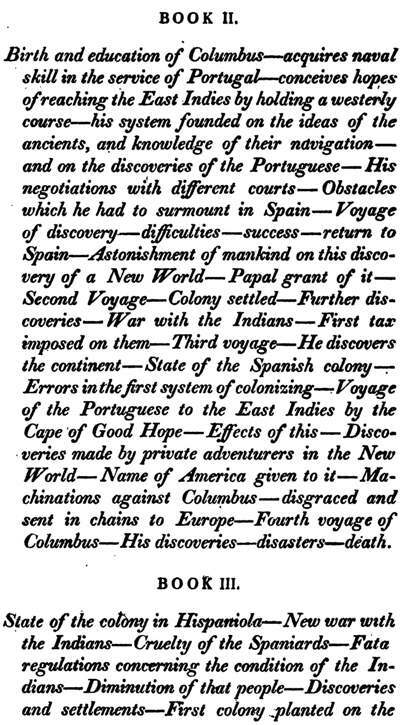 In this way he was led to publish his "Historical Disquisition concerning the Knowledge which the Ancients had of India, and the progress of Trade with that Country, prior to the Discovery of the Cape of Good Hope," which appeared in 1791 in quarto. He had in the meanwhile enjoyed several years of good health and honoured leisure, dividing the time which he could spare from his clerical duties between the amusement of reading and the enjoyment of the society of his friends. Immediately, however, on the termination of the above self-imposed labour, his health became materially affected. Strong symptoms of jaundice showed themselves, and laid the foundation of a lingering and fatal illness. At an early stage of this disease, he was impressed with the belief that his death was not far distant; but, like his great contemporary Hume, he contemplated its approach, not only without terror, but with cheerfulness and complacency. In the latter part of his illness he was removed to Grange House, in the neighbourhood of Edinburgh, in the vain hope that he might be benefited by the free air of the country. He was still, however, able to enjoy the beauties of the rural scenery around him, and that with all the relish of his better days. Early in June, 1793, his increasing weakness confined him to his couch; his articulation began to fail, and on the 11th he died, in the seventy-first year of his age. Dr Robertson’s talents were not precocious. The early part of his career was wholly undistinguished by any remarkable pre-eminence over his contemporaries; but his mind, though silently and unobtrusively, was yet gradually advancing towards that high intellectual station in which it first attracted the attention of the world. He did not, with that ill-judged precipitancy by which authors have often seriously suffered in their reputation and fortunes, come unfledged before the world. As already remarked, he wisely refrained from stepping into the arena of literary competition until he was completely accoutred for the contest, and the success he met with was one result of this prudence and forethought. The friendship which subsisted between Dr Robertson and Mr Hume is, perhaps, next to the genius of these great men, the circumstance connected with them most deserving of our admiration. Though both struggling forward in the same path of historical composition, there were not only no mean jealousies in the race, but each might be seen in turn helping forward the other, and a more interesting sight than this cannot readily be conceived. The letters of Mr Hume to Dr Robertson are full of amiable feeling, and of that light, cheerful raillery, in which the historian of England so much delighted to indulge, and which contrasted so pleasingly with the gravity and dignity of his writings. "Next week," he says, in one of these letters, "I am published, and then I expect a constant comparison will be made between Dr Robertson and Mr Hume. I shall tell you in a few weeks which of these heroes is likely to prevail. Meanwhile, I can inform both of them for their comforts, that their combat is not likely to make half so much noise as that between Broughton and the one-eyed coachman." Dr Robertson in person was rather above the middle size, with an apparently ordinary degree of physical strength. His eye was intelligent, and his features regular and manly. "He appeared," says his biographer, "to greatest advantage in his complete clerical dress, and was more remarkable for gravity and dignity in discharging the functions of his public stations, than for ease or grace in private society." His moral character was unimpeachable. His manners were mild and conciliating, and all his dispositions amiable. "He was," says Dr Erskine, "temperate, without austerity; condescending and affable, without meanness; and in expense, neither sordid nor prodigal. He could feel an injury, yet bridle his passion; was grave, not sullen; steady, not obstinate; friendly, not officious; prudent and cautious, not timid." In the year 1781, Dr Robertson was elected one of the foreign members of the Academy of Sciences at Padua, and, in 1783, one of the foreign members of the Imperial Academy of Sciences at St Petersburg. The empress Catherine was so much delighted with his works, that she presented him, through Dr Rogerson, with a handsome gold enamelled snuff-box, richly set with diamonds. He was the founder of the Royal Society of Edinburgh, and exerted himself with his usual zeal, not only in forming the plan of that institution, but in carrying it on after it was established.